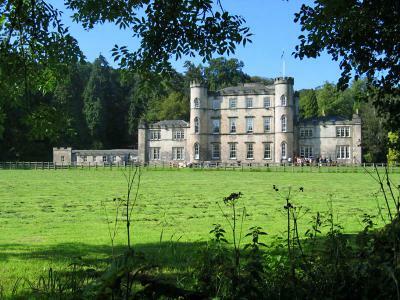 This 18th-Century Gothic castellated mansion, designed by James Playfair for the notable politician Henry Dundas, 1st Viscount Melville, is silhouetted against a magnificent 50-acre woodland estate. Famous for its salmon, the river North Esk borders the estate. 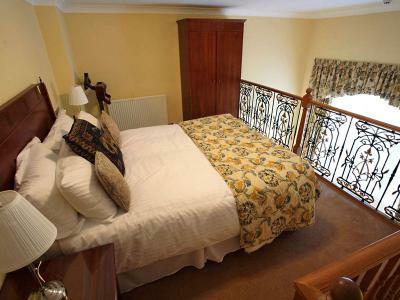 Melville Castle Hotel is a 20-minute drive from Edinburgh city centre and International Airport. The remarkable medieval Rosslyn Chapel, featured in Dan Brown’s novel The Da Vinci Code, is just 5 miles away. Wake up to a wholesome full Scottish breakfast, with haggis and patty scones available; sneak a wee dram in the decadent library bar; dine in the hotel’s French-style restaurant located in the castle cellar; and enjoy the abundance of country pursuits on offer, including golf, clay pigeon shooting, fishing and archery. The former hunting seat of Mary Queen of Scots, Melville Castle Hotel enjoys a magical setting in the heart of Scotland, close to Edinburgh. Visitors to Scotland’s capital will find the prominent Melville Monument at St Andrew’s Square, in the New Town that Dundas helped to establish. When’s the last time you stayed in a historic Scottish castle? The grandeur of Melville Castle's public rooms suggests the distinctly individual character of its period bedrooms, which enjoy enchanting views over the surrounding woodland and complimentary high-speed Wi-Fi. Uniquely, some are set over two floors and feature four-poster beds. Room service is available. Period style en suite bedroom offering free Wi-Fi, digital TV/radio, fridge, laptop safe, writing desk, direct dial telephone, alarm clock, ironing station, tea and coffee making facilities, toiletries, hairdryer, and key card access. Period style en suite bedroom, 86 sqf, offering free Wi-Fi, digital TV/radio, fridge, laptop safe, writing desk, direct dial telephone, alarm clock, ironing station, tea and coffee making facilities, toiletries, hairdryer, and key card access. Double bed. Period style en suite bedroom offering free Wi-Fi, digital TV/radio, fridge, laptop safe, writing desk, direct dial telephone, alarm clock, ironing station, tea and coffee making facilities, toiletries, hairdryer, and key card access. 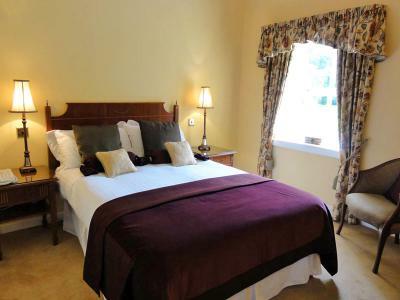 Superior double rooms are split over two floors and are larger than standard double rooms. Four-poster bed. Period style suite offering free Wi-Fi, digital TV/radio, fridge, laptop safe, writing desk, direct dial telephone, alarm clock, ironing station, tea and coffee making facilities, toiletries, hairdryer, and key card access. Lounge area. 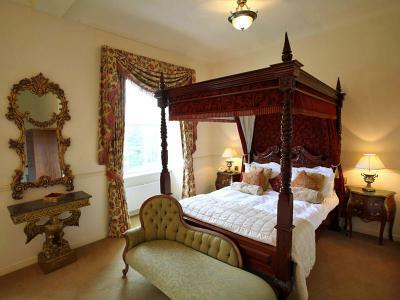 Four-poster bed. Head east towards Eastfield Road. Exit the roundabout onto Eastfield Road. At the next roundabout, take the 1st exit and stay on Eastfield Road. Merge onto Glasgow Road/A8. Take the A720 ramp to City Bypass/South Gyle. At the roundabout, take the 4th exit onto A720 heading to Berwick upon Tweed/A1/Edinburgh South & East. Continue on the A720 for approximately 11 miles. At the roundabout, take the 4th exit onto A7 heading to Berwick Upon Tweed/A1/Edinburgh East & North/Musselburgh/Leith. At the next roundabout, take the 1st exit onto Gilmerton Rd/B6392. Turn right and the hotel will be on your left. Every historic castle hotel needs a suitably historic dining venue and it is with sweet irony that guests are treated to authentic Scottish cuisine prepared from fresh, local ingredients in Melville Castle Hotel's cellar. There are no dungeons in this castle! Intimate, warm-lit alcoves with low ceilings, a flagstone floor and roughcast walls create a romantic atmosphere in which to savour fine food. The cellar bar offers a wide range of wines, spirits, ports and cherries. Guests can also choose to dine in the grand ballroom at Melville Castle Hotel, which features splendid chandeliers and large windows facing the south lawn and fountain. The library bar with its adjoining ante-rooms make a cosy retreat to sit back with a cup of coffee or a cold beer and chat with a friend, relish a good read or play a board game. The bar's high ceiling, views across the lawns and feature period fireplace add to the atmosphere and charm of this unique howff. Watch the world go by with a wee dram in hand to ward off the winter chill. The unique surroundings of Melville Castle Hotel present a wonderful setting for private dinners and celebrations. The hotel caters for reunions, anniversaries, family gatherings, birthday parties, charity and club events, and business dinners. Choose from a range of private rooms, each with its own individual character. Call Classic British Hotels on 0844 967 0984 for advice and let us help you organise a memorable private dinner. Set in the Midlothian countryside, six miles from Edinburgh city centre, Kings Acre is a superb 18-hole golf course and academy, home to Scotland's national fitting centre. The par 70 course has been designed by top Scottish architect Graham Webster and features water hazards, over 50 bunkers and undulating championship-quality greens. Popular with PGA European Tour pros and amateur golfers alike, the world-class golf academy features a whole host of facilities that simulate real on-course situations to help you improve every aspect of your game: 30 floodlit practice bays, fully equipped teaching studios, target greens, a short game area, bunkers, water hazards and a junior course. The Royal Mile runs its regal way through the heart of Edinburgh's Old Town. Wynd your way from the bottom of the high street, where the Palace of Holyroodhouse stands in the shadow of Arthur's Seat, to iconic Edinburgh Castle, at the other end. On the way, pass a glut of attractions and historical sites, including St Giles' Cathedral and the Scottish Parliament, and first-rate eating and drinking establishments. In contrast to the souvenir shopping of the Royal Mile or the eclectic shops of the Grassmarket area, Princes Street offers exclusive designer labels, popular high street brands and shopping institution Jenners, a department store with a difference, opened in 1838. What's more, St Andrew's Square, just behind Princes Street, features the only Harvey Nichols in Scotland. Princes Street is a shopaholic's dream. The National Museum of Scotland is one of the top 20 most visited museums and galleries in the world. This acclaimed attraction houses a fascinating array of over 20,000 artefacts, taking you through not just the history of Scotland, but the world... from meteorites, to dinosaurs, to technology of the future. Explore the Museum's extraordinary, light-filled grand gallery, as well as its other galleries covering art and design, the natural world, science and technology, and world cultures. Located at the village of Roslin, this medieval Midlothian chapel was founded in 1446 as a place of worship. One of Scotland's most remarkable buildings, its profile was greatly enhanced following the publication of Dan Brown's novel, The Da Vinci Code, in 2003. Visitors to Rosslyn Chapel can listen to an introductory talk or guided tour; identify intricate carvings in this 13 metre high masterpiece of craftsmanship; explore the visitor centre and gift shop; and wander around the Chapel grounds or down to the nearby Rosslyn Castle. Melville Castle Hotel is located just 20 minutes from Edinburgh Airport and 6 miles from Edinburgh city centre. There are four principal meeting spaces full of historical character - including the grand ballroom with picturesque views of the south lawn, the fountain and the river North Esk - and additional breakout rooms are available. A permanent marquee decorated with elegant crystal chandeliers and featuring a dance floor is available in the hotel grounds for dinners or ceremonies of up to 200 guests. With 50 acres of private grounds, team-building events and outdoor pursuits such as quad biking and archery can be arranged. There is free Wi-Fi, ample free parking and helicopter landing facilities on-site.